Nancy Margolis Gallery is pleased to announce Meredith Sands’s first solo exhibition at the gallery, Grab n’ Go. The show will be on view April 5th through May 19th, 2018, with an opening reception on Thursday, April 5th from 6pm until 8pm. Meredith Sands’s new body of work, Grab n’ Go, comprises large-scale oil-on-canvas compositions that dwarf much smaller canvases to create striking disparities of scale. 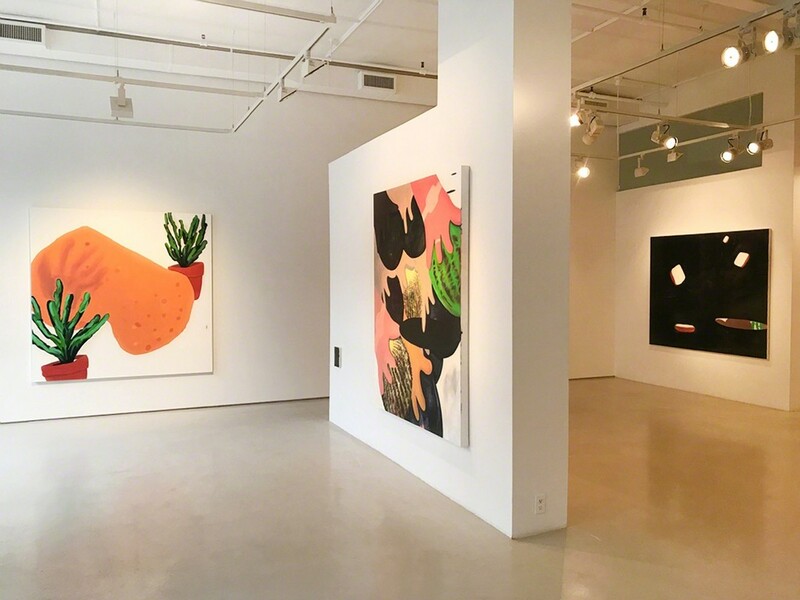 Sands’s oversized works—which span five by six feet—embody two different visual themes. The first theme contains tightly composed, highly stylized works that share a unique color palette of mauve, pink, green, black, and white. These works depict bloated, larger-than-life hands entering the sides and edges of the canvas. 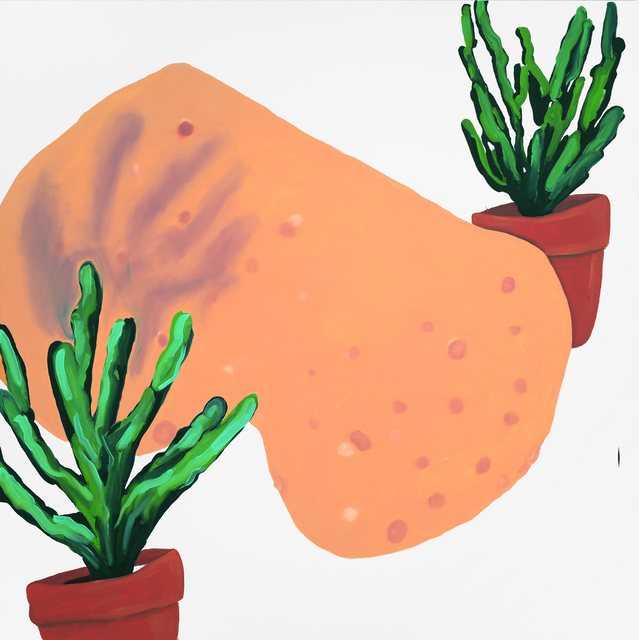 Lacking specificity and rendered with utter simplicity of form, the thick fingers pinch, squeeze, and tower over grotesque images of breasts, bottoms, and cactus plants. Typical in these paintings are expanses of negative space filled with crisp white gesso. Contrasting the purity of these white spaces, Sands incorporated black holes, or voids, into each of these otherwise colorful compositions. 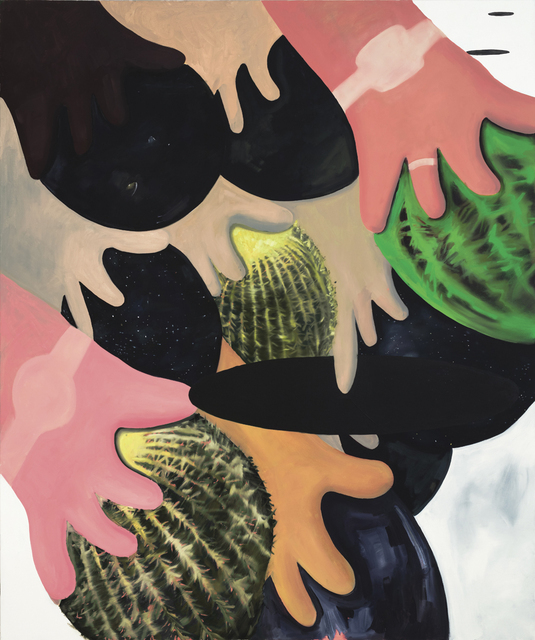 The second theme in Sands’s large-scale canvases poses a jarring visual and emotional contrast to her representations of hands and body parts. 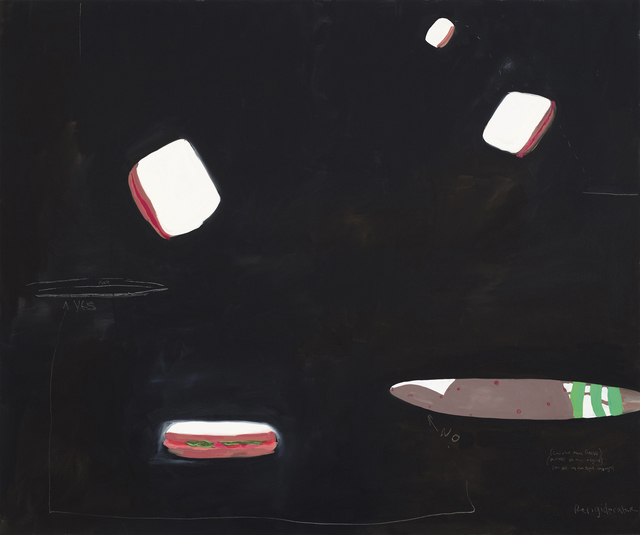 Predominantly black, these paintings depict sandwiches, hotdogs, and hamburgers of varying scale floating throughout a colorless space. In Not Smaller Just Farther Away, Sands thinly scratched white lines into the dark surface. 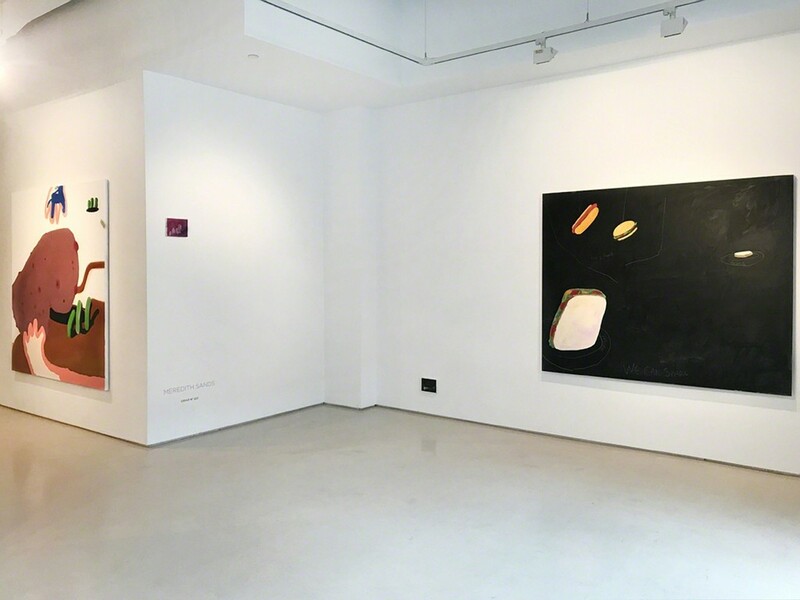 Two concentric ellipses orbit a large sandwich in the foreground with the word “mine” etched into the black paint; in the distance, a smaller sandwich is shown with a similar set of rings paired with the word “yours.” The organization of space in these black paintings feels freer and less constrained than Sands’s tightly composed colorful works. The objects in her black paintings appear to float randomly, as if artifacts in outer space. Meredith Sands grew up in Malibu, California. She received her B.F.A from the School of Art Institute of Chicago in 2010 and her M.F.A. from Columbia University in 2016. She has been in solo and group exhibitions in New York and Chicago. In 2013 she participated in the Giorgio Upiglio Residency in Milan, Italy. 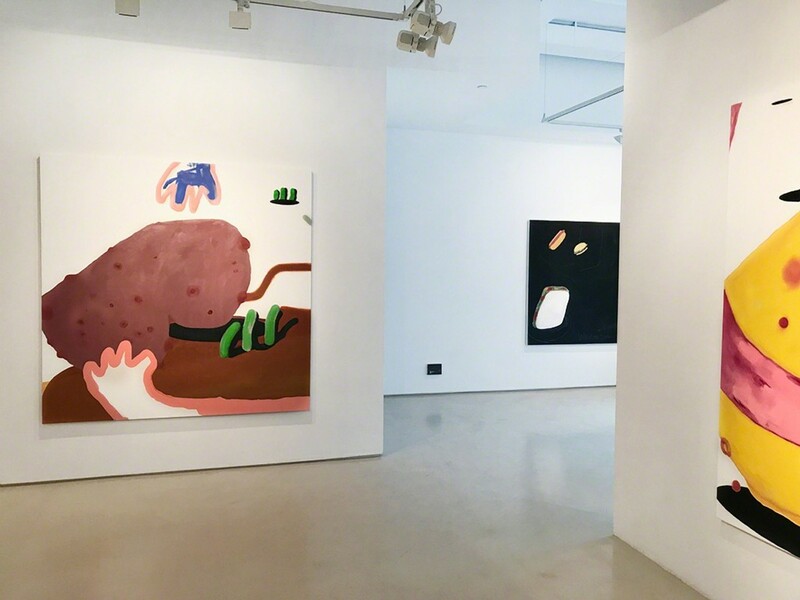 Sands was a part of a group exhibition at NMG in 2016, making Grab n’ Go Sands’s first solo exhibition at Nancy Margolis Gallery.